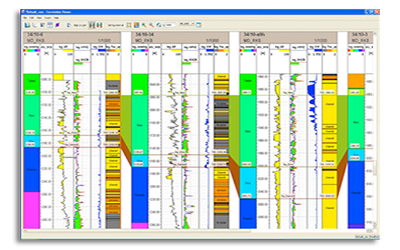 RMSwellstrat is a correlation and geological interpretation tool integrated into the E&P industry’s leading 3D reservoir modeling solution, Irap RMS. It allows interpreters to handle complex geology and realistic well geometries in a truly 3D environment, dramatically shortening geological interpretation workflows. Roxar wanted to develop a new version of this software that could handle large volumes of wells, typically hundreds or more, while maintaining very good graphical performance and full interactivity. At the same time, Roxar wanted to improve usability and modernize the User Interface. The development environment for Irap IRMS was C++, OpenInventor and Qt. Since the previous correlation view was not built with Qt, Roxar decided to rewrite this part of the application. To help speed up the development, Roxar chose INT’s GeoToolkit C++ library. The WellLog component of GeoToolkit was easy to use and flexible enough to support all the log visualization and interaction requirements. Performance turned out to be a bit of a challenge for the big datasets, but after some collaboration, INT optimized the library to meet the display speed requirements. Roxar is also very pleased with the high-quality support for hardcopy and the print preview capability. Using the WellLog library, developers at Roxar significantly reduced the total development time and were able to put more focus on new functionality and ease of use. Roxar released the new version of its correlation software into Irap RMS 2010, which has been well received by customers. They like the new functionality, the quality of the display and the advanced hardcopy support. At the same time, Roxar has been using GeoToolkit C++ in other projects, including a data analysis module using the new Chart library functionality. Roxar is currently collaborating with INT to develop additional modules. Roxar, a business unit of Emerson Process Management, is a leading international technology solutions provider covering the entire reservoir optimization value chain. Roxar’s objectives are to help oil & gas operators increase oil & gas recovery from their reservoirs, reduce uncertainty, and make improved field management decisions.